I had been considering doing something involving water whether it was bubbles or dewdrops. I took pictures of a flower that I had sprayed water on and had many drops of water between the petals. I thought this would be a cool picture to do in color pencils because even though the flower was red there were many other variations of colors in the petals and in the background. 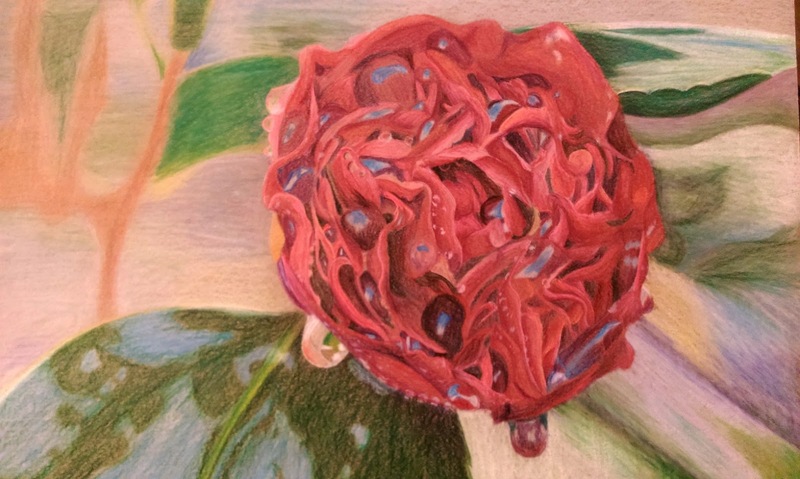 I had never used Prismacolor pencils so I had been kind of worried about how well I could make them blend together but I am really happy and impressed with how I was able to capture all the colors and shapes in the flower and in the background. I would now choose the color pencils for future projects because I was really happy with how they made the image looked. I was a little unsure about how I would do the background and capture the blurry look of the leaves and colors. While I could have done the background more simply than the picture, it wouldn't have had the same effect. I did learn though that if I used the light grayish color pencil over the colors, it lightened them up and made them less definite and captured that blurred look.